Raw Spicy Cream of Carrot Soup. I always have a ton of organic carrots in my typical and I’ve become quite the carrot addict just eating them raw. 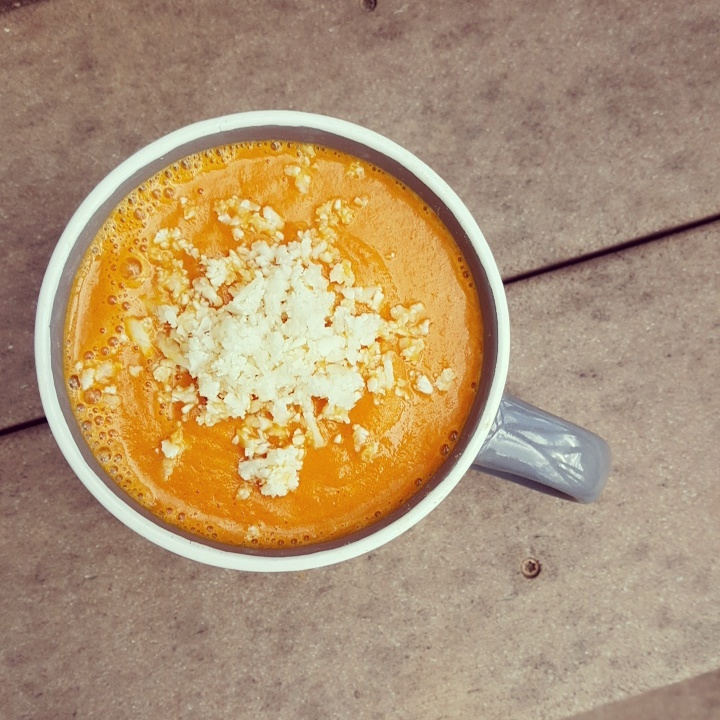 Today I was in need of a quick lunch and with the help of my vitamix I whipped up a 5 minute raw carrot soup. Blend all ingredients in high speed blender I warmed it to a raw temperature. I added in a squirt of Sriracha and a few shakes of cayenne pepper. If you don’t like spicy foods omit these ingredients. Add soup to bowl and use a grater to shred the cauliflower into rice to top on the soup. Makes it look prettier with this added touch. Congratulations Julia! I’m so happy you started your food blog, the recipes look delish! Thank you for checking out my blog, I appreciate the support! I’ve got a lot recipes to add so I’m hoping to tackle that this weekend.